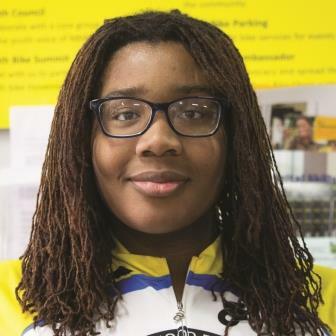 The Neighborhood Bike Works Youth Council serves to build youth leadership and youth voice in the NBW community. The Council offers their ideas on new NBW programs and events to staff and other leaders in our community. At times when NBW makes critical organizational decisions, NBW staff and Board consult with the Youth Council to understand a youth perspective and gather additional input. Youth Council members facilitate connection and communication between staff and youth program participants. With help from the Youth Council we hope to become a more youth-led organization, attuned to the interests of youth leaders. NBW's Youth Council formed in 2014 after several NBW youth leaders attended the Youth Bike Summit. 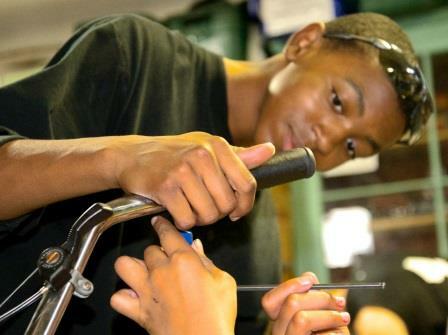 In 2013 Joshua joined an Earn-A-Bike class at Neighborhood Bike Works and never looked back. He has since completed every program we offer and now serves at Youth Council president; he facilitates all Youth Council meetings, gathers input from Council members, and appears at all types of NBW events and programs. We can count on Joshua to keep the Council organized and focused on reaching its goals. You might have met Joshua at one of the three Youth Bike Summit conferences he has attended with Neighobrhood Bike Works. Marc comes from South West Philadelphia and has been with NBW for two years. Marc loves helping people make stuff happen. He joined the NBW Youth Council in 2017 and has completed NBW's Leadership and Advanced Mechanics Course, Winter Bike Build, and served as a Summer Cycling Day Camp Assistant Counselor in 2017. James is a fixture at Neighborhood Bike Works. After completing an Earn-A-Bike class in 2012, James has put in hundreds of hours in our shops. All of his hard work led to earning a job at Trophy Bikes in 2016. James maintains meeting notes for all Youth Council sessions and always offers thoughtful ideas. You might see him in West Philly with a bike trailer in tow. Qaasim joined NBW in fall 2016 and has embedded himself in all NBW programs since! When Qaasim joined NBW he was looking for a bike. 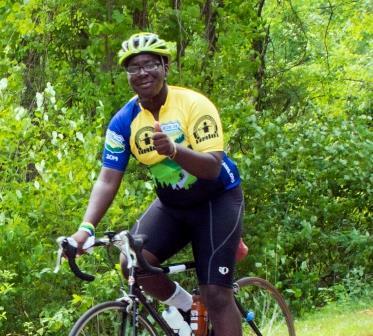 Through Earn-A-Bike, he got a bike and through NBW ride programs he has become a confident year-round, all-weather cyclist. As Treasurer, Qaasim co-manages the Youth Council budget and develops fundraising ideas. Everyone at Neighborhood Bike Works knows Adiva. Her outgoing and friendly character make her pefect for the Outreach Coordinator role. Adiva makes friends everywhere she goes - in all of our programs, events, and far beyond. As Outreach Coordinator, Adiva spearheads recruitment of new Youth Council Members, engages students at NBW graduations, and works with the Treasurer organizing fundraising and service projects. Adiva and her fellow Council members organized a pretty sweet fashion show this past May 2017.